Analog Devices, Inc. today introduced the fully integrated ADXC150x series of inertial combo sensors that brings together best-in-class reliability and accuracy with industry leading shock and vibration immunity at a reduced footprint. The integration of up to four degrees of freedom in a single device allows system designers to reduce the size of the electronic control unit (ECU) required in today's automotive safety systems. Minimizing these large error sources is mission critical to designing more reliable and accurate automotive safety systems, such as robust Electronic Stability Control (ESC) and rollover detection. These build on traditional chassis control systems already in the vehicle, including the anti-lock braking system, traction control, and yaw control. Current ESC and rollover detection system designs often involve two or more discrete accelerometers and gyroscopes, which offer less shock and vibration immunity while costing more and requiring more board space. The ADXC150x combo sensor family overcomes the substantial challenges associated with integrating an automotive-grade gyroscope and accelerometer in a single package. These innovative combo sensors integrate up to 4 degrees of freedom (DOF) into a single device, which not only reduces component count and expensive, time-consuming custom integration, but also improves inertial sensing accuracy and reliability. Yaw gyro drift over temperature is less than 1 deg/s (typical) and the internal temperature sensor calibrates the output to provide excellent stability across the whole automotive temperature range (-40 oC to 105 oC). Driven by Analog Devices' commitment to functional safety, the ADXC150x also features comprehensive electromechanical fail-safe routines and continuously monitors device health to ensure the integrity of the data. 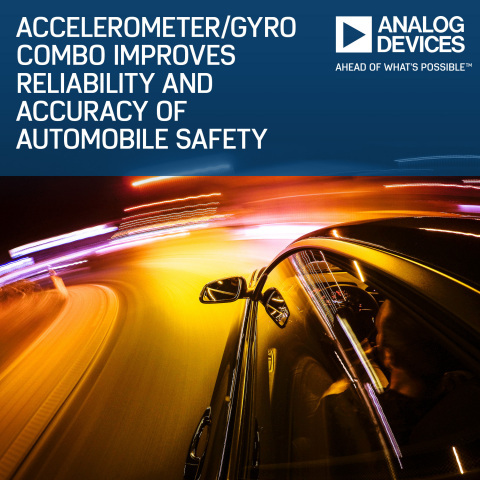 Following decades of inertial sensor innovation 1, Analog Devices continues to lead the market with advanced accelerometer and gyroscope designs that help save lives. The unique ADXC150x gyroscope with its patented differential Quad-Sensor™ design effectively rejects linear acceleration, including external g-forces and vibration. The advanced accelerometer features a low Q sensor beam design with exceptional noise rejection performance and a wide dynamic range enabling robust overload signal handling in the most challenging automotive environments. Two configurations are initially available: the ADXC1500, which features a dual-axis accelerometer with yaw rate gyro, and the ADXC1501, which features a three-axis accelerometer with yaw rate gyro. Both offer SPI digital output and are available in a 16-lead inverted cavity SOIC package for robust EMI performance. Analog Devices (NASDAQ: ADI) designs and manufactures semiconductor products and solutions. We enable our customers to interpret the world around us by intelligently bridging the physical and digital with unmatched technologies that sense, measure, and connect. Visit http://www.analog.com. 1 In 1991, ADI sampled the industry's first single chip high- g MEMS accelerometer using its innovative surface micromachining technology. In 1993, ADI achieved the first volume shipments for airbag safety systems. Quad-Sensor is a trademark of Analog Devices, Inc.